The second most visited national park in the U.S., a UNESCO World Heritage Site and a natural wonder revered by just about everyone, this colossal canyon has beckoned people to its cutaway gorges for hundreds of years. 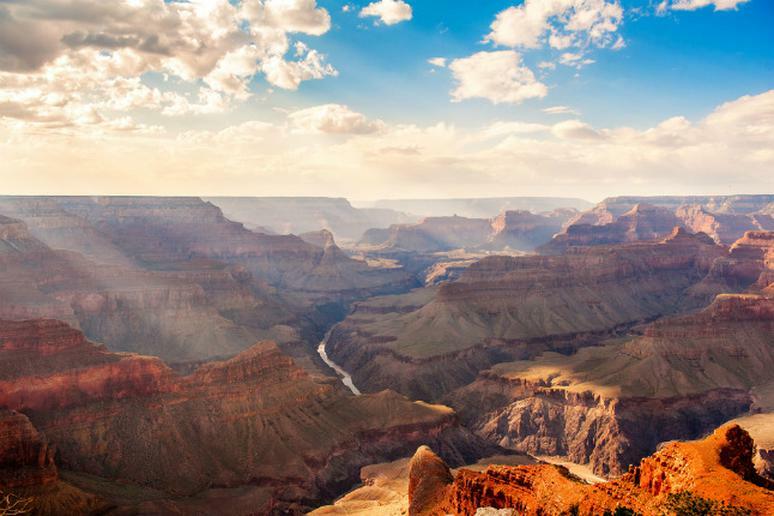 From Native Americans who considered it a holy site to the masses of tourists that visit today to take in the grandeur, the Grand Canyon and it’s almost two billion years of geological history is a landmark whose importance is evident at first sight. That said, it can be simply overwhelming, but we’re here to help. Hiking, biking and so much more—here’s where you should go to do and see it all. If you’re looking for some of the best lodging options, historical sights and views of the Grand Canyon, head to the Grand Canyon Village. Stop in to the railway depot for an incredible history lesson or stop into shops for souvenirs and artwork inspired by the Grand Canyon. Winding 1,450 miles in total and cutting through one of the seven natural wonders of the world (the Grand Canyon) this river is undoubtedly one of the most popular rafting destinations in the world. The Colorado River offers waters ranging from class I to class V rapids and some incredible places to stop off. Rafting trips through the Grand Canyon range from 6 days to more than 20 days—either way the views and the experience as a whole is said to be magical. Stop in to Bright Angel Bicycles to rent a bike, take a tour or enjoy a great cup of coffee in their cafe. Seeing the Grand Canyon on two wheels is an unforgettable experience and if you feel a bit uncertain about where to ride, the experts at Bright Angel Bicycles can either point you in the right direction or actually take you out on a tour. Don’t leave the Grand Canyon without a trip to the North Rim—the more rugged and less touristy section. Closed through the winter and without many of the “comforts” of the South Rim, the North Rim is a relatively more natural and less crowded alternative. Check out Bright Angel Point and Point Imperial for some of the best views of the canyon.